Is it that time already? Seems like snowboard movies come out earlier every year. I just found out about this one. 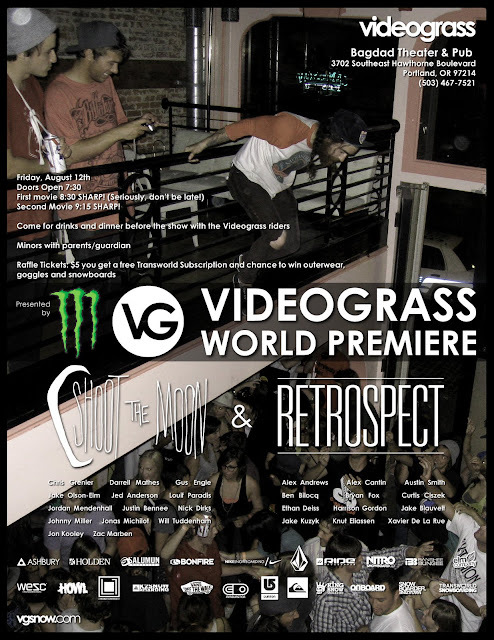 Videograss' Shoot the Moon and Retrospect; Friday, August 12; Portland's Bagdad Theater & Pub; doors at 7:30pm; raffle drawings; autograph signings; oh yeah, and it's free. Minors allowed with parent/guardian. Check the flyer or Videograss' site for more info.